Helping patients out of pain through dentistry that is both functional and aesthetic is one of the most rewarding parts of a dental career. 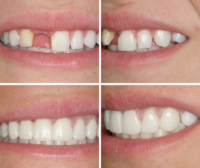 A restoration that involves tooth replacement can be especially impactful. In this post, Dr. Jones relates a heartwarming story about a case where he completely changed a patient’s life through her dental treatment. His ability to improve the patient’s comfort during a restoration made all the difference. I met the patient in this case at a high school function because she attended classes with my daughter. We were there for a dinner event and it was obvious she was in a considerable amount of pain. Speaking with her at that time, I learned that she had been through dental hell with her upper anterior teeth for the last four years. From knocking out #8 and having numerous makeshift bridges and flippers to recently having an implant fail, she was desperate. At the time she told me she had not smiled in years. By the time of our dinner conversation, her implant had already been placed. It was removed several weeks later with the idea of trying it again, a procedure she dreaded and wanted to avoid. At the same time, however, she did not want to begin her college freshman year with her teeth as they then looked. We immediately began treatment. Among my concerns were the space and ridge of the missing #8 and the angle of the existing anterior teeth. The interproximal space between teeth was a positive. The case was planned with the support of Paul Lindsey at Gold Dust Dental Lab. 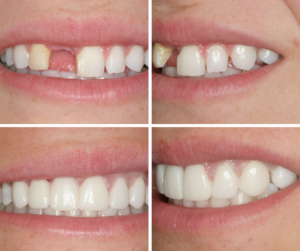 Empress was used for restorations and upon completion the patient was given essix retainers and an occlusal orthotic. Contrary to when we first met, the patient now says she can’t stop smiling. Did you miss the last Case of the Month? Check it out here!